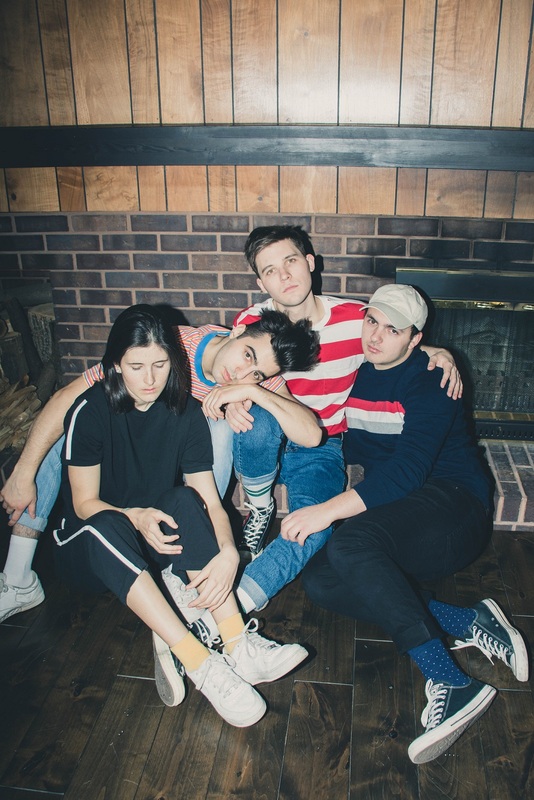 If Valley’s dreaming, they never want to wake up: The rising indie pop band dive into their fresh, vibey new music and multi-EP ‘MAYBE’ project in our interview. The story of Valley starts when two roads align at the right time and the right place, but also by complete fluke. A few years ago, two musical duos were accidentally double-booked by a mutual friend at a studio back in Canada. Rob Laska (vocals) and Alex Dimauro (bass) had a project from high school; Karah James (drums) and Mike Brandino (guitar) were doing their own thing as well. Laska recalls, “[James and Brandino] were recording something in the room, and we heard it and thought it was really cool. The rest is history.” Joining the two styles together was a natural process: All four musicians vibed quickly, thus deciding to join forces as a band together. This opportunity – one that arose out of complete accident – has helped make Valley into one of the most refreshing sounds in alternative pop today. Ever since that fateful day, the born-and-raised Canadians have been developing and refining their sound. Valley’s 2016 EP This Room Is White has been streamed over 10 million times, propelled by breakout single “Swim” and the band’s distinctive blend of style and sleek sounds. Their newest project, MAYBE – Side A (the first in a multi-part series for the band’s debut album, released November 2018 via Universal Music Canada), has further expanded the dedicated fanbase Valley have been forming over the last few years, showcasing their experimentation with different styles and directions. A definitive Atwood Magazine artist-to-watch, Valley spoke with Atwood Magazine on their drive back from New York City after seeing friends Joan open up for The Aces at Bowery Ballroom. Read into the Valley story and hear about them evolving with their new music, the making of their multi-EP MAYBE debut album project, and what they hope the future holds. If Valley’s dreaming, they never want to wake up. Catch the band on tour with THE WLDLFE this spring! Atwood Magazine: How did Valley become the band’s name after the two dues merged? Rob Laska: I wish there was a more magical story to it, but ours is pretty simple. There is symmetry with V and Y, and the two Ls. We are big fans of how things look visually and wanted a one word name. Not a lot of bands start with V, so it was a very visual thing and it looked nice on paper. Band names take on their own kinda names in general. Like where does Fleetwood Mac come from? MAYBE - Side A sounds a bit different in production and sound from your last album This Room is White (2016). You all worked with Andy Seltzer on this last project. How was this process compared to your first album and how did you find this new evolved sound? Laska: We started writing for the record and went to New York City for a few weeks to get some inspiration and flavor for the record, and we ended up working with Andy. We had a little writing session booked with him and vibed really hard and he really understood our vibe and we wrote a song together. That turned into coffee and kinda talking about working on something more together. Andy ended up flying up to Canada to work on the whole record. He really acted as this fifth member of the band. We already had an idea of what we wanted to do but we needed someone in the room to really boost our confidence and really tie everything together. He kinda always came up with those ideas that really solidified each song and kinda sorted everything together. He was a really important role and now he’s one of our best friends and like our biggest mentor. The process didn’t really feel much different than This Room is White. We obviously did a little more traveling and co-writing but still did the whole album in our basement in the suburbs of Canada. We still recorded everything the same way as This Room is White, we just had Andy in the room and we had more knowledge. The day after submitting This Room is White onto Spotify, we already knew what we could change, what we can do better, what we can do differently, and what can we experiment with. How long did it take to complete the album? Were they written in that time period after your last album or were they written kinda within all the same time? Laska: After This Room is White (2016), we definitely took some time to tour and we slowing started writing songs that were ideas that we hashed out but nothing crazy. I’d say six months into releasing This Room is White, we started kinda thinking of the album. It took about two years to write. We were writing the whole time too though and ended up with about 70 songs. I’d say the last few months before we released MAYBE – Side A, that was when things really started to come together. I’d say four months to record all of them but the writing was all throughout the two years of collecting ideas, and four months to kinda finish it all. Now it’s all done and we’re putting it out! What made you decide to do Side A and Side B? Laska: For us, we were thinking of a way to test the release strategy. All the sides together is about 16 songs. In one case we could drop 16 songs on people and that’s it, but we were kinda thinking of a way to give every song its space and every focus track its space and even after all these sides, it still turns into a full album. It’s still the same concept and art of having it top to bottom but we wanted to give it some more life. It’s our first record and we wanted to make sure people had the time to really explore every facet of it and at the end of the day you still get the full album, so we thought it was a way to do the best of both worlds. We were really inspired by John Mayer’s ways and a bunch of people that were kinda doing mini EPs. The 1975 did it before their first record too. It was a really cool way to get a lot of people into the music more slowly and digest it all. We might not do it the next time but it just something we thought was right for this release. Side B has six new songs on it and is coming out this spring. Is there a release date set for this? Laska: We just got this Lennon Stella tour, so we kinda lined up Side B with this tour. So the first single off Side B comes out March 15th. After that, we basically go on tour and at the end of the tour we are dropping another song off Side B, which will be the second single and the song we are really looking forward to putting out! It’s kind of like the focus track of the record. Super important song. Then Side B will come out shortly after that and then after there there is more music coming. There’s a Side C that we are doing. Trying to not give too much away but it’s also going to be really cool. I was going to ask you guys about the Lennon Stella Tour. How was that connection made and are there songs in her live set that you are excited to hear? What are you most excited about for the tour? Laska: Ah man, we are pinching ourselves everyday waking up. It’s crazy! It’s our first like big, major support tour, which we have never done, so it’s definitely an experience we are super stoked for. I mean, every song she has is amazing. Probably hearing Breakaway live or Fortress or any of those. The whole EP is a masterpiece in our opinions. It’s gonna be really cool to study her every night and see how she does things. She’s so incredibly talented and we are just going to learn a lot from watching her and we are super excited. The whole thing kinda came about really randomly. We kinda started talking to Lennon a few years ago and she messaged us one time and we stayed in touch. Honestly it was so fortunate for her to like the music and to bring us on the road. We are incredibly thankful and we are pinching ourselves, it’s crazy, we are super excited. Really excited to play New York, LA, you know, obviously the big cities, but excited to play every place. There are so many places we haven’t played in America. It’s going to be our first time in Chicago and first time in Milwaukee and Seattle and it’s such a trip. I can’t wait! How did you come up with album cover? 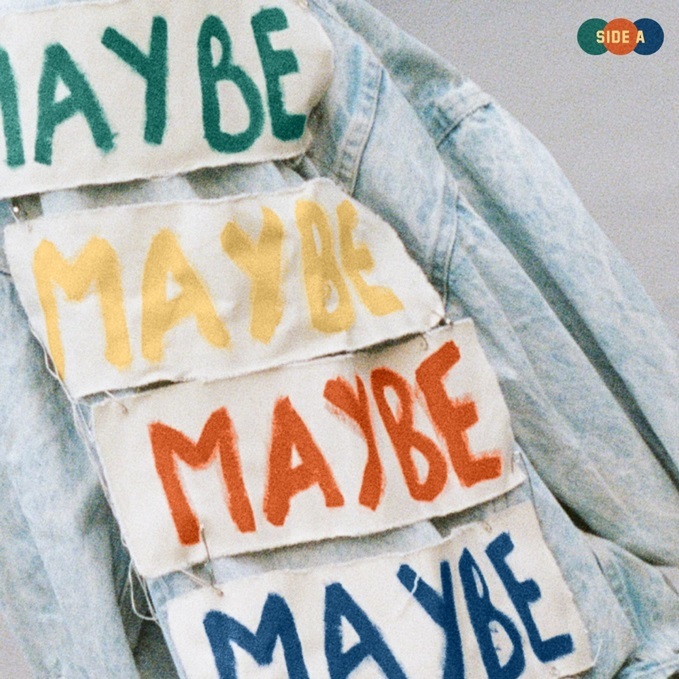 The jean jacket idea and the maybes painted on the back with the theme of the green, orange and blue colors? Do the colors have meaning? Laska: We always envisioned something like that for the record. We had a bunch of different ideas of what the cover could look like and we had the colors early on. Per album era or EP we always pick four or three colors that kinda represent the mood of the record. So we had those picked out pretty early on. Then we were like, what’s a way that we could like put this into a picture that’s just something that could represent the record? We were really into zoomed-in photos… We think there is something really beautiful about having something like, really focused. 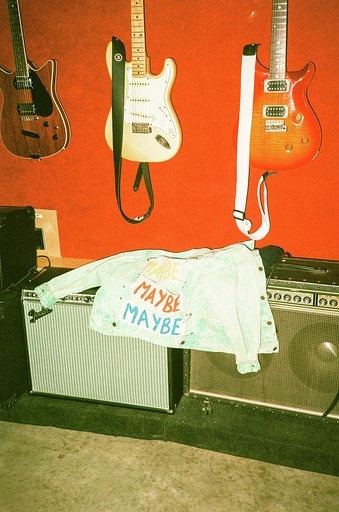 I don’t remember who came up with it, I don’t know, maybe it was Karah, but we took four patches and kinda just painted them on and just randomly pinned them to this jacket we bought on tour. Our photographer friend Becca kinda snapped a shot of it and it worked. There’s something really powerful about it, just looking at it all zoomed in and that’s kinda how it came about but we kinda always envisioned something like that. We had a few different ideas with a bike and an elliptical and a person on a street, but we ended up going with the zoomed-in image and it felt the most powerful to look at. There was just something about it. I feel like Valley are really into having everything visually pleasing with your music, social media, and everything else. How did you come up with the treatment for your newest video “Closer to the Picture”? How did that come about and what was that like to record and shoot it? Laska: That idea came from collaboration with friends. We did that video with some friends that we have known for a long time. My friend Mark had an amazing team of people that got together and we kinda worked on that concept together. From day one we were looking to do something that kinda represented the movements and feel of the song, which is very quirky and has this left of center kind of bop to it. Originally, we were like we want to do something in a house that’s kinda decorated in a Wes Anderson kinda preppy vibe and scatter props that represent the album all over the place. We built this story around these two personalities that clash, but end up working together at the same time, and we wanted to hone in on some personalities that you witness at social events and parties. Take a weird quirky twist on it, because the song is essential about social anxiety. It’s about going to a party and wanting to either talk to people and be a crazy social butterfly, or you just wanna go find the dog and not talk to anybody, so it kind of teeters on those two ideas. We worked together and wrote something that represented the song well. It was a really fun video to shoot! It was crazy, we blacked out the house and kinda had to make it look like nighttime but we shot it during the day. It was super hot in this house because it was in the middle of the summer, 40 degrees celsius, so crazy hot and we were in sweaters. It ended up being so fun, and it is one of our favorite videos we have ever done. Valley have been together for a few years now, so what has this whole experience given to you so far and what do you hope the future holds for you? Laska: That’s such a great question. Every day we wake up and are super thankful to even be in the position that we are in. It’s very very very easy to forget how lucky we are to make music. That people listen to it and like it and tell us and invest in it. That’s just crazy and all you could ever dream of as a kid in high school trying to tell your parents and friends that you want to play music, so we are super super thankful. I think we have learned a lot. Starting out it was very difficult, you know. We grew up in the suburbs of Toronto just dreaming about New York and LA and all these places where music was really happening. It’s a huge learning experience…Years of figuring out what we want to be, how do we want to represent ourselves, what kind of music do we want to make and kinda just really really taking it day by day. We still are. Everyday, again, we are pinching ourselves that we get to do this and people are listening. We are super thankful and definitely learned a lot but definitely learning a lot more nowadays. You never know what’s going to happen. We don’t really know what to expect, you know the future is unpredictable. One day you are making music in your basement and the other day you are going on tour with Lennon Stella! Every week is something different and we are just looking forward to getting in front of people and playing music and getting to meet everybody that loves the music. Growing and making the best music we can make and that’s all we can hope for. Super super happy to be doing it.